How to read data from a text file in Isolated Storage in Windows Phone ? 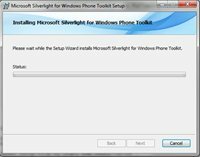 How to add Windows Phone Silverlight Toolkit Controls to Visual Studio 2010 ? 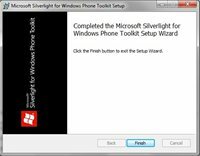 What is Silverlight Toolkit for Windows Phone ? 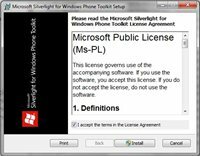 Silverlight toolkit for Windows Phone is a opensource framework which provides additional controls for the developing Windows Phone Applictaion apart from the standard Windows Phone controls . The installation process of the Silverlight toolkit for Windows Phone is fairly simple . 2. Double click the downloaded setup file to start the installation . 4. This will start the installation of the SIlverlight Toolkit for Windows Phone . 5. With in few seconds , the installation of the silverlight toolkit should be complete . Click finish to close the Window . 6. You will find the Windows Phone Toolkit installed in the following folder of your system . “C:Program Files (x86)Microsoft SDKsWindows Phonev7.1ToolkitAug11” . Note that i am using 64 bit machine and hence this path is used to save the files .